Q: What do you think got everybody focused in that same direction? Vershan Jackson: Not only the coaches, who were of one mind as far as being physical and all that, but as players we had coaches out on the field: player-coaches. Players who would get up in your face when you made mistakes, players that would light you up when you made a mistake, players that would be there when you found success. We pushed ourselves as players at Nebraska. You have to take that on yourself. It can’t just be the coaches that push you. You have to put in the extra work yourself and push yourself, doing extra fieldwork. I can remember, I was up for Lifter of the Year in ’96 and, of course, Jared Tomich won it, and I was second place. And going into ’97? That summer we didn’t have coaches out there pushing us. We pushed each other. We said, “Hey, look, if you’re loafing, are you a part of this thing or not? If you are, we expect you to get up there and work just as hard as everybody else that’s working hard.” We got in their face. I was a team captain in ’97 along with Aaron Taylor and Grant Wistrom and Jason Peter. So we really were all about making sure that everyone knew that we were gonna work hard and we expected everybody else to work just as hard as we worked. Q: Speaking earlier of the necessity of physicality, what team do you have the most respect for in holding up as well as they did versus Nebraska? VJ: There were two teams: Wyoming and Washington State. I have awesome respect for those two teams, because they came into Lincoln and they gave us a fight. We hit them in the mouth but they didn’t lay down, they hit us right back in the mouth. Those were the two most physical games that I’ve ever been a part of. But if you talk about consistency and we get back into the Big 8/Big 12? And this is gonna shock you, but the team that we would beat the smoke out of, but they would not lay down, was Missouri. We would beat ’em up and beat ’em up, but those guys at Missouri always came to fight. And even though they were always out-manned, out-gunned and out-matched, they came to fight. Over the long haul I have a lot of respect for Missouri because they wouldn’t back down. They couldn’t beat us but they didn’t back down. Q: What is your most memorable play? VJ: Talking about my own play I was in on? Gosh, there are so many. I think it probably would be one of the many touchdown runs. I was a pretty good blocker. I loved the blocking and running aspect, but I think my most memorable play would probably be the Iowa State game when I caught my second touchdown pass, about a 30-yarder. My eyes were huge! It was my junior year and I‘m having the game of my life, almost 100 yards receiving and two touchdowns (I should have had three but I slipped down on one). It’s just a quick tight end release turnaround. (Keep in mind, we’re on the one yard line.) So I’m thinking to myself -when he calls ‘52’ I look over at Tommie- and I’m like, ‘Oh my goodness, he’s calling 52. This is me. This is my chance to score a touchdown. Don’t drop the ball. Look the ball in. Get off the line.’ I’m thinking all these things. And I end up with one catch, one yard, one touchdown. That was my first touchdown. I always tell Tommie, ‘I appreciate you getting me my first touchdown.’ And that was my most memorable play because it came at a time of adversity. The score may have been 7 to 7 at the time and we went on to win. I don’t remember the final score, but it was my first touchdown and first reception. 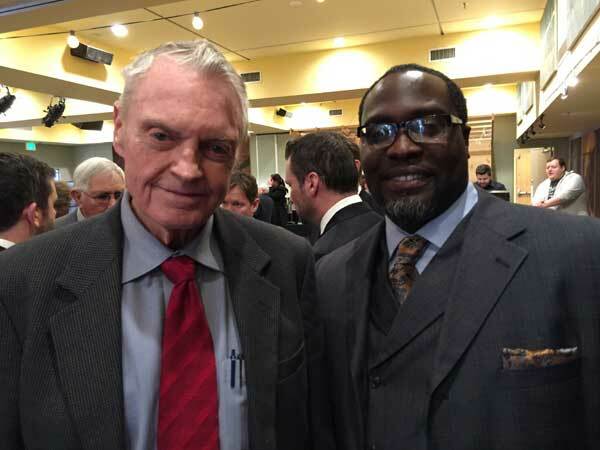 Q: Running plays in and standing next to Coach Osborne all the time, what kind of working dynamic was going on between Tommie and Brook and Coach Osborne? Was it like three brains operating perfectly on the same wavelength? VJ: Definitely. Let me just say this -Coach Osborne may disagree, but I don’t think he will- 50% of the plays were called by Tommie, Brook and our quarterbacks on the field by way of audibles. 50% of the time when coach sent the plays in the quarterback could audible or call, “Opposite.” They were like coaches on the field, they were mini-Osbornes. Q: ‘Opposite’, that’s when they tapped a hand on the helmet to change the play call, right? Q: Adam Treu informed me that it was a way to run the same play, but simply in the opposite direction. Were there ever times when you missed a call? VJ: The same game, that Kansas game. Of course this was a televised game, and I believe 47 Dive was the play. It was maybe Tight Right 47 Dive. But it’s on TV, and I run it in and tell Tommie the play. And we get up on the line of scrimmage and Tommie is looking like, “Something‘s not right. Something’s not right.” And you kind of just see him call the timeout… and you can hear him do it on the TV. When I got home all my family and friends were like, “You messed up, didn’t you?” I was like, ‘Why’d you say that?’ They said, “We could hear Tommie say, “Vershan, you brought in the wrong play!” (laughs) I was like, ‘Oh, my gosh!’ When I got to the sideline Coach Osborne was, “What play did you call?” (laughs) That was one time where I definitely brought in the wrong play. Q: By the time you entered the huddle from the sideline you completely forgot the play? Q: Since there were only three games lost, which one of those stands out to you the most? VJ: All three of them. Because you take Florida State my freshman year: we should have won that game. And we fought and fought and fought and we came up a little short, but I think that game gave us… it almost was like blood in the water and we were sharks. We understood at that point that we could play with anybody in the country, because here was this Florida State team that was supposed to blow us out, and here we are hanging and fighting and biting and clawing. And at the end of the day there were some controversial calls in that game that could have went the other way and I think the game would have turned out differently. The second game that sticks out is Arizona State. I think that was a wakeup call in ’96 where we went back out there to the desert again. We were going against Jake ‘the Snake’ Plummer and we didn’t play very well on offense, and the defense played pretty good. We gave them two safeties; offensively we just couldn’t get it going. Scott Frost was in his first year trying to get it going, but to bounce back and win the rest of the games the way we did? And I think that Texas game is the game that really sticks out. And not to make any excuses, but we had a lot of guys that were really sick that week and had the flu going around, but losing that game after losing early? And here we would have been in another national championship game. You go back to that game and relive it in your mind and you say, ‘We left a lot on the field that game.’ To win that game would have put us back in the Sugar Bowl and the national championship game where, technically speaking, had things gone our way, my five years at Nebraska we could have played for the title for 5 straight years. All we had to do was win that Texas game and we would have been back in the National Championship game. VJ: There’s not too many guys who can say they went 60-3. You’ve got Grant Wistrom and Octavious McFarlin, who played as freshmen in ’94: those two guys probably have one of the best career records of anybody in college football at 49-2. These guys didn’t lose too often, and two of the games they lost was in the same year. It’s amazing. VJ: Yeah, where are you going to go? The Henry Doorly Zoo? Maybe the College World Series or some hunting? But I think the one thing you do see in Nebraska is football. 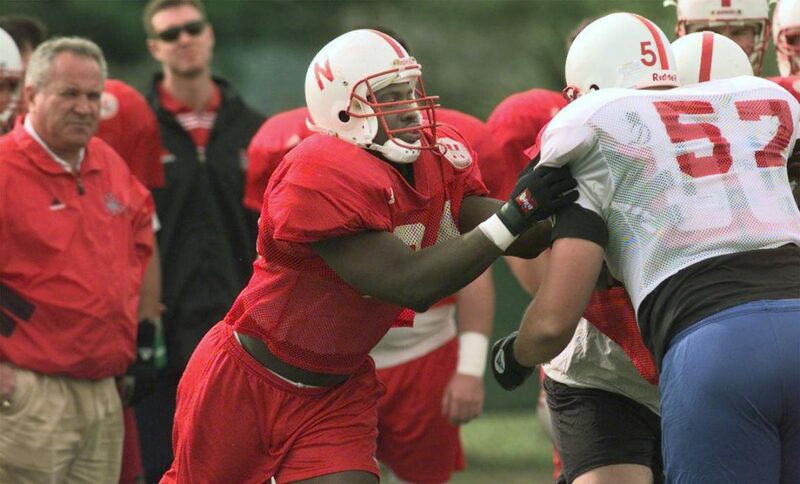 I’d always wanted to play for Nebraska. I’ve been a Nebraska fan since I was 5 years old. I sold lemonade at the games. VJ: Oh yeah, I sold lemonade as a young man at the games. I would sell as many racks as I could the first half so I could sit the second half and watch the games. We had a great run, and at the end of the day it boiled down to us playing for each other, loving each other, and working out with everybody else. Q: Now, I’ve got to go back to the lemonade thing. I suppose by halftime you were a pretty sticky kid after spilling lemonade all over yourself? Q: So how did you get the job? VJ: Well, Johnny Rodgers and Robert Faulkner had started a lemonade deal. And Faulkner (who coached football at Flanagan, which was right down the street from my house and we’d always go up to Flanagan for track practice and stuff like that), of course he would employ some of us inner-city kids to make some money and sell lemonade. We didn’t make a ton of money, but we had a rack of 25 lemonades. Sell the whole rack and I think you got three bucks. (One lemonade was almost three dollars!) (laughs) It wasn’t a glorious job but it kept us employed. It kept Nebraska football in front of us and we got to see the games for free, so you wouldn’t trade that for anything in the world. Q: I’m sure your legs the next day were dead tired from walking those stadium steps? VJ: No, not really. 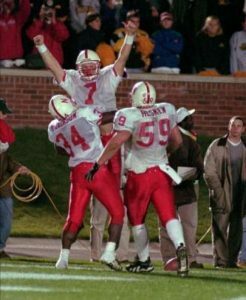 Like I said, there was a reason I played at Nebraska: I was one of those kids who had a lot of energy and the stadium steps never bothered me at all. It was a good time. Q: Now, you went to the pros after school was over? VJ: First I went to Seattle, then Kansas City. It’s so funny, because all three of my years I always walked into the situation where we had a new coach: Dennis Erickson just got the coaching job at Seattle. And then when I went to Kansas City Gunther Cunningham just took over. Q: Playing for Erickson, did he ever bring up the fact that you guys beat his Miami team? VJ: He didn’t really say too much about that. He always said that us Nebraska guys were strong guys, but he never dabbled much into that. 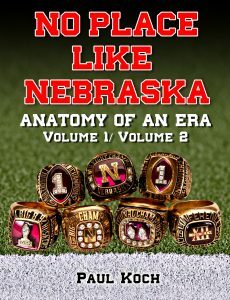 Q: Was there a particular type of athlete they recruited, any special parameters Nebraska was looking for in those days? VJ: You want to recruit a kid who plays with heart. Football players? It’s not about the size or how big they are. It’s not the size of the dog… it’s about the size of the fight in the dog. And I think you want to get a guy that will fight, that has a big heart and is not scared to run through a brick wall, a guy who has a high motor and runs all over the place. That’s the type of guy to go recruit because that’s the type of guy who’s gonna give 110% and then some. Guys who are leaders and not followers. Q: So do you have any funny, memorable off-field occurrences? VJ: I can tell you a funny on-field occurrence…. It’s my senior year and we’re playing at Baylor. A young Joe Walker is our return guy and it’s opening kickoff and everybody’s excited. I’m all juiced up, and here Joe comes and he’s breaking out and I’m excited and jumping up because he looks like he’s going to take it to the house. And the ref is backing up and running down the sideline… and I don’t realize that I’ve stepped over the sideline and I’m on the field! And I’m jumping up and down, and all of a sudden the ref comes out of nowhere. And he’s just about to turn around. And the second he turns around I just ‘rock and roll’ him; I give him a shot that lifted him right up off the ground. VJ: Right! I should have known they were gonna catch me on film. I figured it was better they catch me on film on Monday than during the game. Q: So who do you think played crucial role behind the scenes? VJ: When I think about guys I think about Dennis Leblanc: him keeping us eligible, him keeping us graduating. 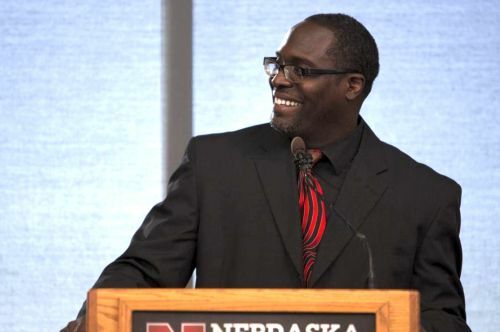 There’s a reason Nebraska leads all its member schools in graduation rates among its athletes. You’ve got to take your hat off to Dennis Leblanc because that guy kept us eligible, he kept us going, let us know when we were messing up in school. He kept tutors on us. He just kept an eye on us when you talk about school work. That so important, because we weren’t just athletes, we were student-athletes. He sees the educational pieces and how important that is. He was always great at making sure you understood the position you put yourself in. Another guy who doesn’t get a lot of exposure and gratitude is Bryan Bailey, who worked for our strength staff and works for USC now. There’s a reason why USC is a dominant team, and I assure you Brian Bailey is a key part of that. If you wanted to get some extra work in the weight room he always had a workout for you, he always pushed you whether you were running or lifting weights. Bryan Bailey pushed us and gave us techniques that you couldn’t pay for. A lot of crazy stuff. Q: So is there anything I haven’t touched on that you feel made a difference for those great Nebraska teams? VJ: Like I said before: you’ve got to work hard, you’ve got to prepare hard, and you’ve got to play hard. And you’ve got to play with heart. When you do that you’re tough to beat. When you play with heart and know what you’re doing and go 110% you’re a tough team to beat. We’ve heard of the fighting: In pads, out of pads, perhaps even behind locker room doors. Like a secret society, a club or fraternal order, they had their ritual ‘beating in’ through a series of two-a-day efforts and season-long one-on-one run-ins under the watchful eye of staff, peer and press. Only the strong survived, only the undaunted endured. The men who speak on these pages passed that crucible: conquering trauma, cowardice and self-doubt at just about every turn, yet persevered. We owe them honor if only for that.